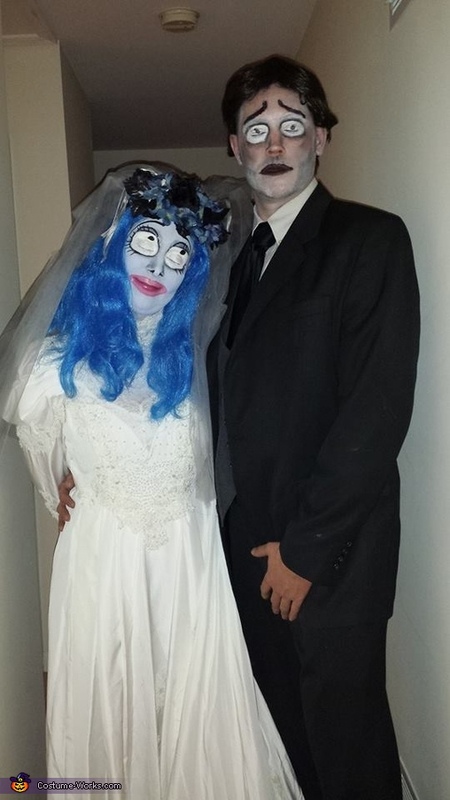 My boyfriend and I decided to dress up as the corpse bride (Emily) and her groom (Victor) for Halloween this year. The costumes are pretty simple to create. I bought an old wedding dress from Good Will that I distressed (ripped, spray painted, etc.) and my boyfriend just wore an older suit. The toughest part of the costume was the makeup, which we successfully recreated following the instructions of a YouTube makeup tutorial. I wore a blue wig from the Spirit Halloween store and created a floral veil with fake flowers and a glue gun from Walmart.